Corrado Provera must be shaking his head and smiling a quiet smile of satisfaction. I'm not referring to his Peugeot Rally team's success last season, winning the FIA's Rally Championship and Marcus Gronholm taking the drivers' title, although those would be reasons enough to smile. The Italian transplanted to France more than two decades ago and became head of Peugeot Sport in June 1998. What did he find there? The veritable vestiges of the Talbot Ligier Formula One team in which his employer, PSA Peugeot Citroen, had invested in 1982. Provera had been in a PR capacity during the struggles of that team, which that year was eighth in the Constructors' Championship. Now, however, the remnants of Ligier had been taken over by Alain Prost for an estimated $15 million. And they were using Peugeot engines. At the end of 1998, Prost-Peugeot would be ranked ninth among the Constructors. They would be seventh in 1999 and nowhere in 2000. During these seasons you'll recall that Provera had to put up with endless complaints about the reliability and power of the Peugeot engines he was providing to Prost. If Alain himself wasn't grumbling about them and blaming them for his car's poor results, Jean Alesi was ridiculing Peugeot's efforts. Did Provera believe strongly in the Prost alliance? I doubt it. I reckon that he was brought in to dismantle it, which he did with great success. He sold the engine project on to Asiatech, recouping some of PSA's investment, and disentangled his company from its alliance with Prost. So why is Provera smiling? Because without Peugeot's engines the Prost cars are still moving about in the nether reaches of the grids and finishes. And what engines are they using? None other than the very engines and transaxles that took Ferrari to both World Championships only a few months ago! They are the same engines (albeit with less development this year) that Sauber is using in its astonishing and gratifying revival of form this season. And with their Ferrari engines the Prosts are making heavy weather of coping with the challenge from the Arrows team, which is powered by the ex-Peugeot V-10s tweaked by the Asiatech outfit. It's nice to be proved right once in a while, and Corrado Provera has certainly had that pleasure so far this season. Prost Grand Prix seems in little danger of scoring any points this year. "It's not the year we're going to blow everyone away," Alain admitted. So far in 10 starts it has had 7 finishes, none of them menacing the top six. Jean Alesi was eighth at Brazil, ninth at Australia, Malaysia and Imola, and 10th in Spain. Gaston Mazzacane had only one finish in 12th place and three retirements, two of them drive-train-related. He must be hard on equipment; it can't be that easy to massacre Ferrari parts. New man Luciano Burti at least beat Mazzacane's best result by finishing 11th at Barcelona. Burti could be good news for Prost. Certainly Eddie Irvine praised him on his departure from Jaguar, no doubt to try to destabilise Pedro de la Rosa on his arrival at the English team. This seems to have worked, by the way. Although Burti arrived at the Guyancourt-based team in a roundabout way, he will bring the testing and chassis-setup skills that Prost desperately needs but Alesi has failed to provide. After all, the new AP04 was called "one of the best cars I have ever driven" by Jean during the testing weeks. What he meant was that he enjoyed driving it, not that it was any good - an assessment that Alesi is manifestly unqualified to make. Although Alain puts on a good show - the cars at least look terrific - he is struggling on the sponsorship front. The loss of Gauloises and Yahoo! as backers was a blow just as he took on the crippling cost of the Ferrari power trains. Prost has a two-year deal with Ferrari, backed in part by funds from Taiwanese computer maker Acer - hence the engine badging. 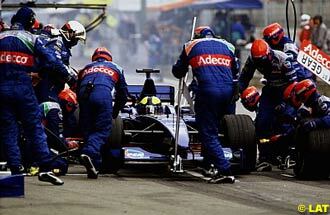 Alain's aim is to look good enough by the end of the 2002 season to deserve free engines from a major maker. The rumour mill says he's trying to attract General Motors. Prost's problem is that he can't make progress without top designers, and with his constrained budget he can't attract the best technical talent. He is supposed to have an exclusive lock on the services of John Barnard, but that once-great designer is conspicuous by his absence from any current involvement with the team. From McLaren Alain has recruited aerodynamicist Henri Durand, whom he knew in his Ferrari days. Durand is supposed to be "technical director", which is a big step for the Frenchman considering that he wasn't all that wonderful at McLaren as an aerodynamicist. We can safely reach that conclusion because Ron Dennis didn't insist on Durand taking "gardening leave" before joining Prost. As managing director Prost has brought in Spaniard Joan Villadelprat to hold the fort while he looks for sponsorship. Villadelprat at least is a proven manager with experience at both McLaren and Ferrari. The team's wild card is former driver Pedro Diniz. With his supermarket-magnate dad Abilio, Diniz has taken a 40% shareholding in Prost Grand Prix. Ten percent is held by luxury-products group LVMH while half remains in the hands of Prost personally. Thus Alain is more than entitled to have his name on the sides of the cars - much after the style of Ken Tyrrell - while he is waiting for the right sponsor to fill those spaces. But Diniz is said to want a bigger share in the team, and with that would come control and, as well, a bigger chunk of the profits if and when the team is sold. Although Prost has problems aplenty, I am pulling for him. I like the idea of a driver turning car-builder in Formula One. It's also unusual that a driver has done it for the sake of other drivers, not to build a car that he can drive himself. In this respect Alain's only counterpart is Jackie Stewart. For both Stewart and Prost the expectations have been high, as Joan Villadelprat pointed out: "When you are talking about Alain Prost, four times World Champion, everybody expects him to be on the ball and winning races in one year." It will take a lot longer than that, but the man they called "the Professor" could make it to the top. No one would be more pleased than Corrado Provera.